Planning that perfect wedding ceremony, honeymoon holiday, romantic date, special birthday or Christmas family vacation? These best restaurants in the world will take your breath away with their extraordinary design ideas, amazing views and unforgettable dining experience. 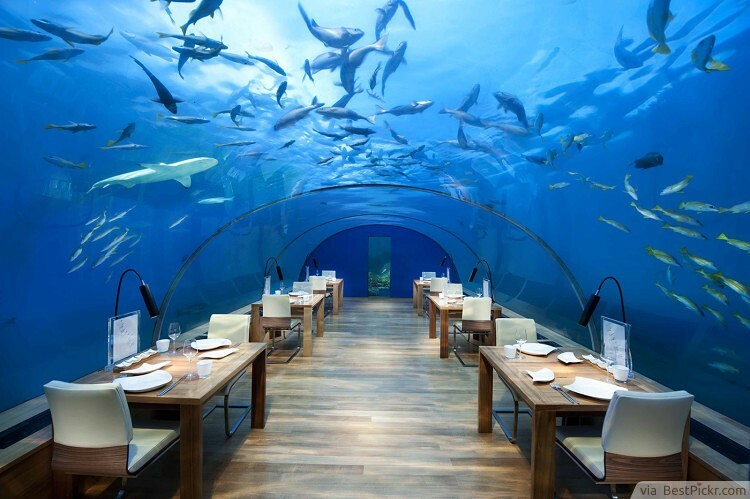 This interesting restaurant design speaks one thing– be close to nature. And how can you not be when you’ll see a lot of green all around you? 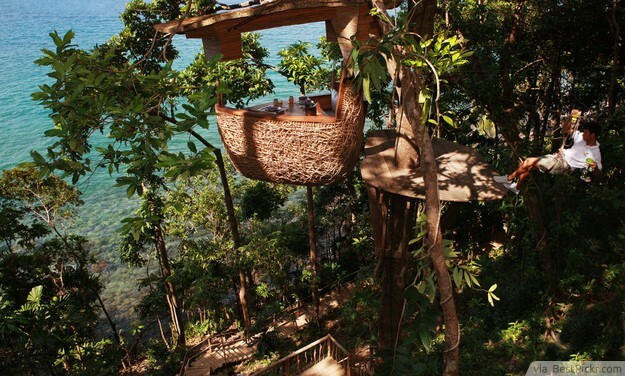 You will be seated in an authentic bamboo dining pod and your food will be delivered with breathtaking stunts. It will also make you reminisce on your childhood days when you persist on climbing a tree. 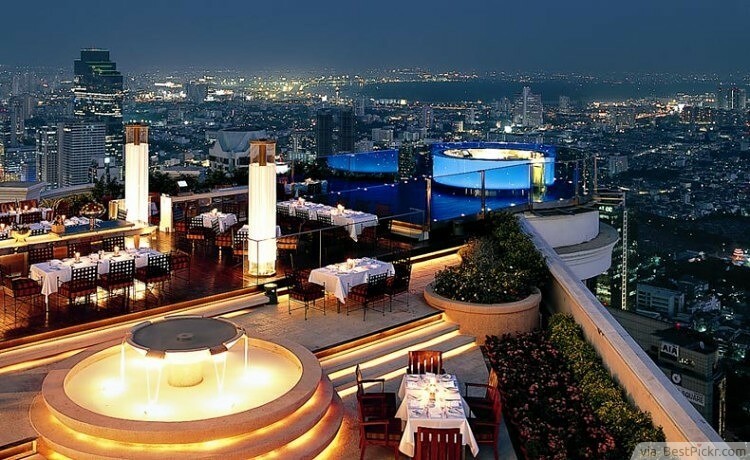 A very innovative restaurant design idea, Sirocco in Bangkok Thailand continuously wow patrons and tourists with its modern but warm atmosphere. The view, together with the classic interior and excellent service makes this place iconic. 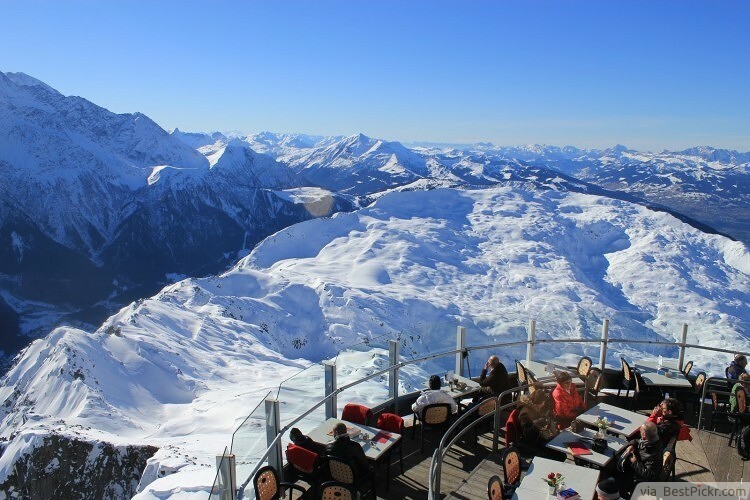 No doubt, dining in the world's highest open air restaurant will be an exhilarating experience. Since Tokyo is a very modern city, it is a nice idea to take advantage of its beautiful view. 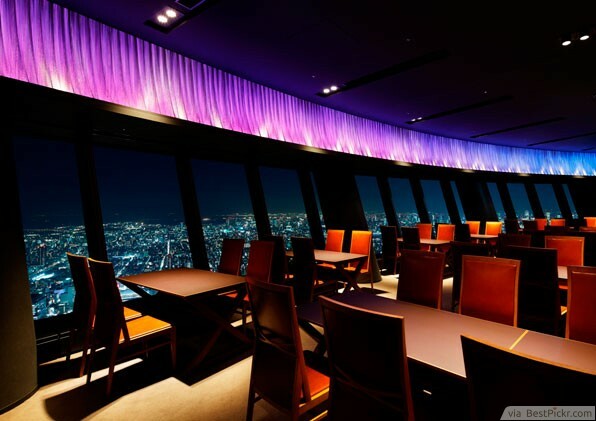 A lot of people make reservations during the evening because it's the time when all the city lights are up and the view is most spectacular. 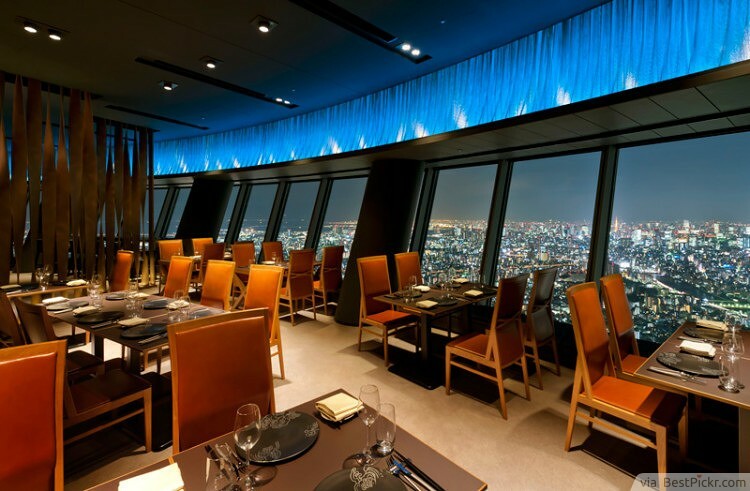 The interior of the restaurant is a mixture of modern and classic, that, together with the view, will make you feel like you're on top of the world. 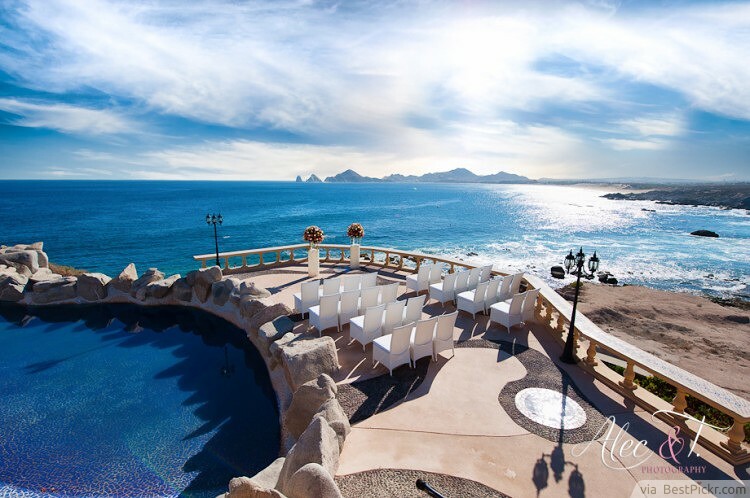 If you want to dine at the tail end of a bay and watch the beautiful sunset while enjoying great seafood, this restaurant in Mexico might just be your next destination. How often will it be that you can overlook the Pacific Ocean while enjoying good food? This place can also be perfect venue for special occasions such as a wedding. 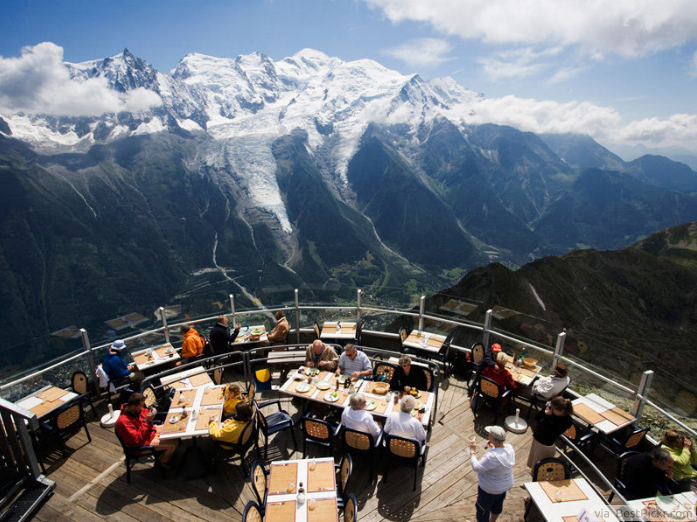 If you're looking for a casual dining experience but want to remain adventurous, try this restaurant in France that offers the panoramic view of Mont-Blanc. The transparent railings will make you feel like there is little to no barrier between you and the view. Come winter season and the mountains will be covered with snow-- which will make it even more breathtaking. 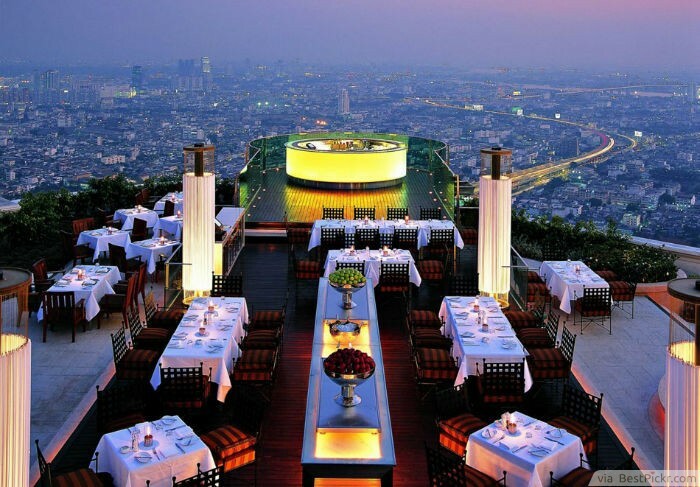 Soaring toward the clouds, this haughty open-air restaurant built atop a skyscraper hotel will make you forget all your earthly cares. While the sunset paints a masterwork among the clouds, the city below turns on its bright lights, creating a spectacular panorama. Feel the sand under your feet as you take a seat beneath the rocky artworks of nature. 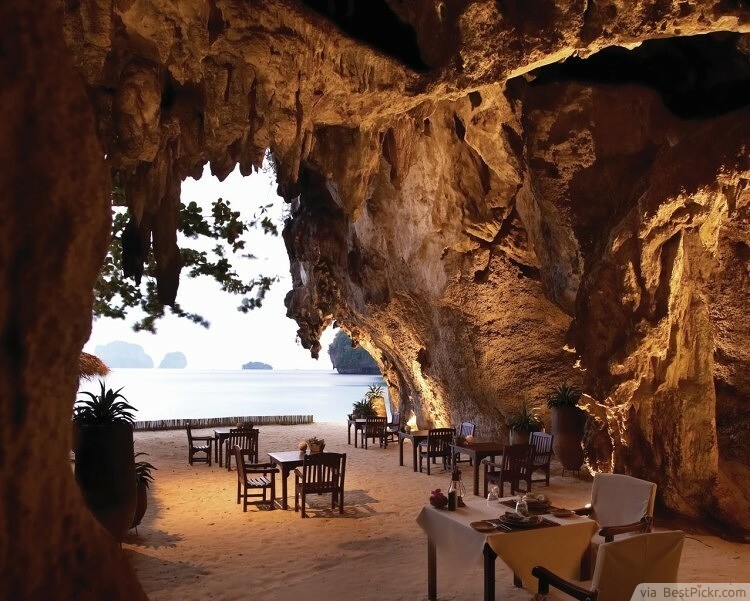 Far from the bustle of the world, this beautiful grotto restaurant offers you an intimate setting with a wondrous vista -- the measureless sea. 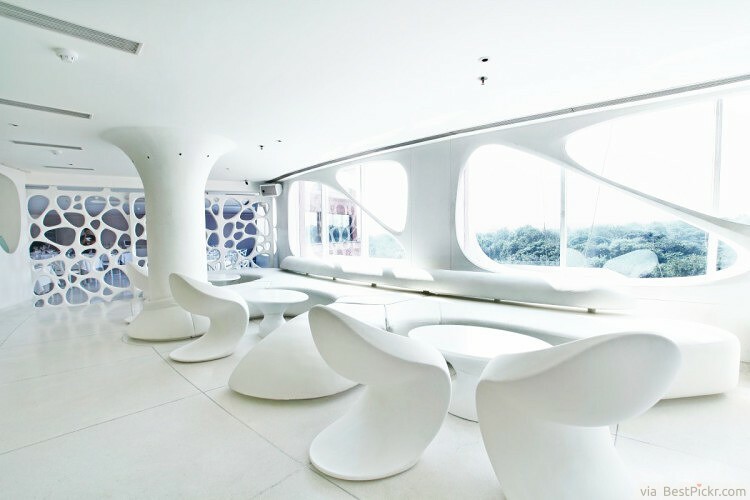 This futuristic restaurant dazzles you with its explosion of white interior comfort. Geometric shapes and curves are used creatively to make you feel like a star in a sci-fi movie. Don’t let the odd chairs fool you — they’re said to be super comfortable. Are you ready to get wet and wild? 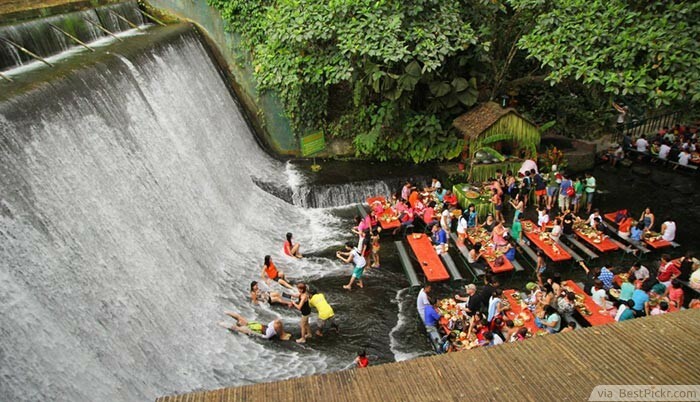 If you’re going to this natural outdoor restaurant in the Philippines, you have to be! 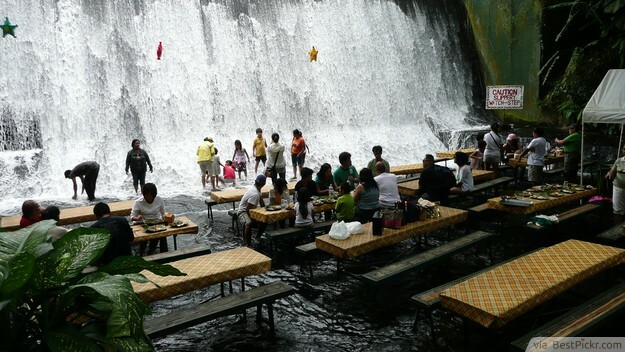 Because you will be sitting at the foot of Labasin Falls, you have no choice but to get your feet (and your whole body) wet. The dining is buffet style, so you can eat (and bathe) all you can. Who needs walls when you're surrounded by 180,000 year old coral cave? 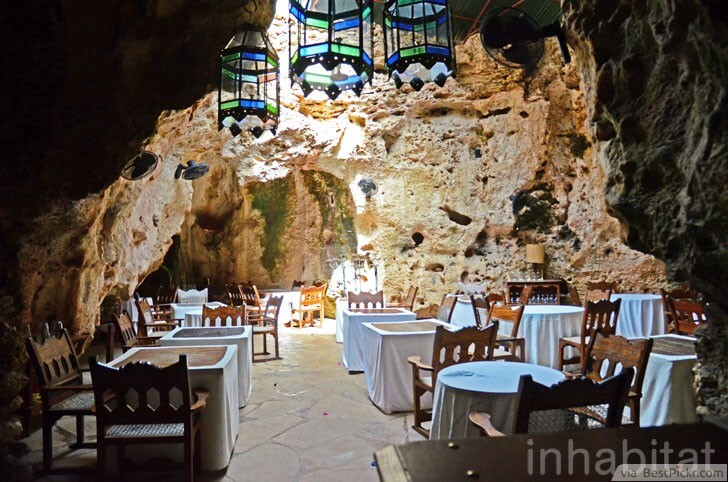 This Beautiful restaurant in Kenya really took advantage of the idea. 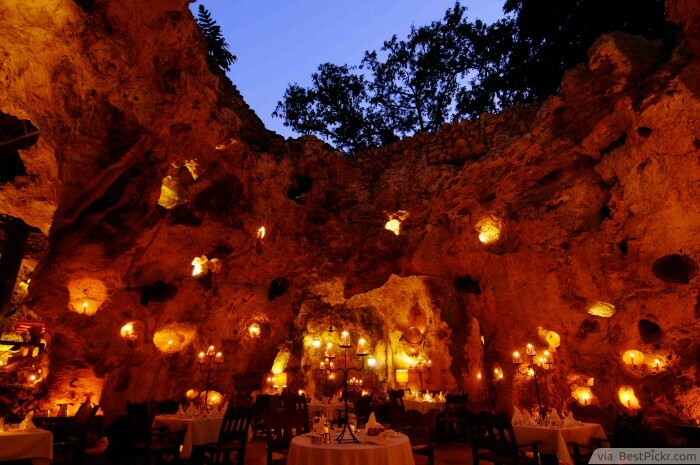 The natural contours of the cave give a very elegant atmosphere perfect for fine dining. 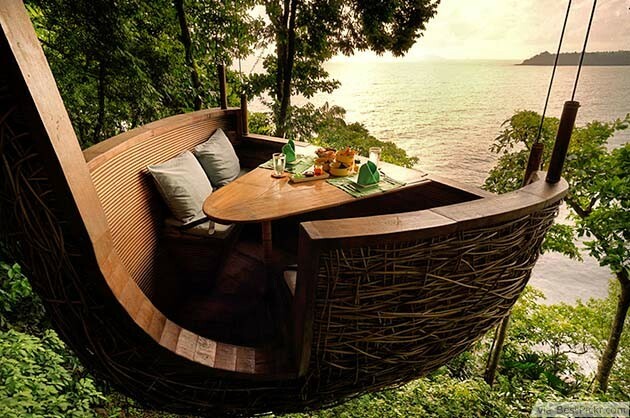 The hole that is open to the sky also adds to the dining appeal. Just because it does not have a natural view that involves mountains and seas, Asiate Restaurant can still take your breath away. The cloud-grazing buildings give out a formal ambiance which is a good idea if you’re hosting a corporate event. 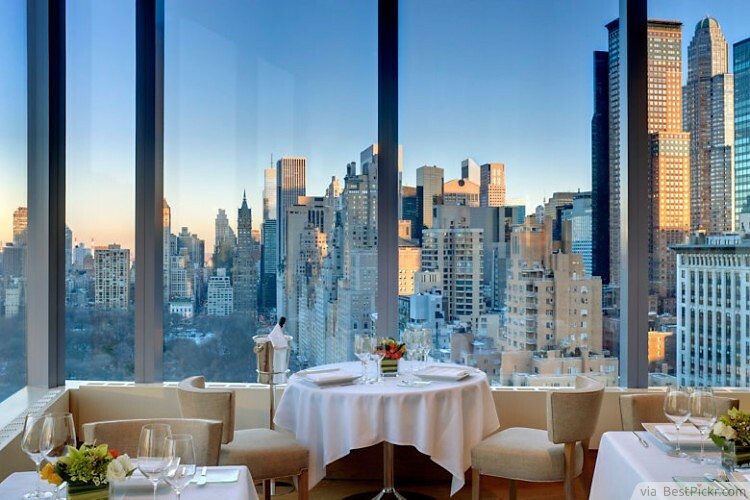 This beautiful restaurant is located in Mandarin Oriental Hotel in New York. 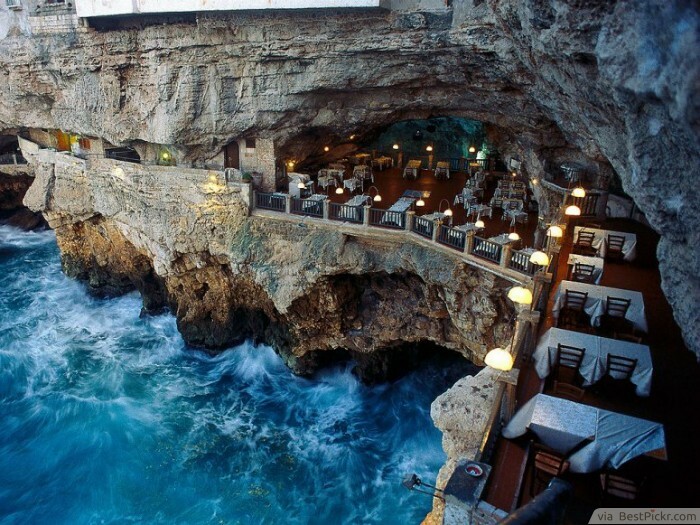 This restaurant in Italy took advantage of a cave's natural beauty both for the interior and exterior design. Although Ristorante Grotta Palazzes tend to close when the weather is bad, just be patient and you'll be rewarded with great meals and spectacular view. You'll be surprised at how the angry waters can soothe your mood.